The effect is that the magician shuffles and then hands the spectator the deck of cards, while explaining that he's going to do a trick onehanded. The spectator HIMSELF removes one card and puts it face down on the table, and then gives the cards back to the magician. The magician fans the deck, inserts the chosen card into the middle of the deck, and then holds the deck perfectly squared in one hand. He holds the deck near his face, and then...with one hand...and with all fingers exposed, and absolutely no motion of any sort, the chosen card slowly rises from the deck. 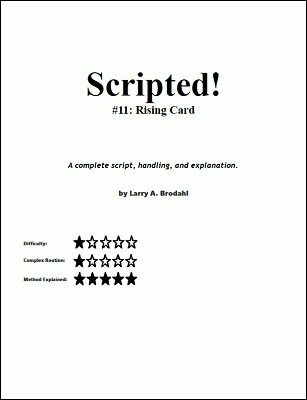 This ebook gives you every line, joke, piece of timing, setup, move, rationale and nuance of the routine. The Secrets of Doctor "A"